The 1922 E122 American Caramel Baseball Card Set contains 82 unnumbered cards measuring 2" x 3 1/2". The E122 set is nearly identical to the E121-80, except that the background behind player name, team, and position is gray. Notable Hall-of-Famers included in this E122 American Caramel Set are: Ty Cobb, Eddie Collins, Grover Alexander, Johnny Evers, Walter Johnson, John McGraw, Babe Ruth and Tris Speaker. 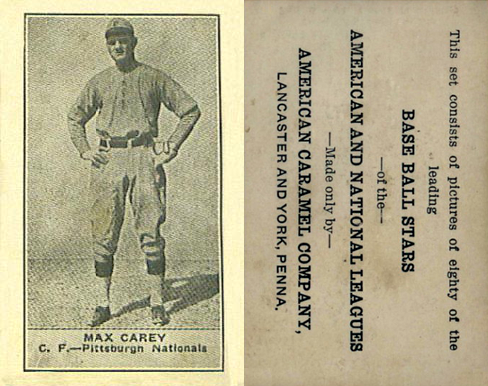 CLICK HERE if you want to sell your 1922 E122 American Caramel Baseball Cards.